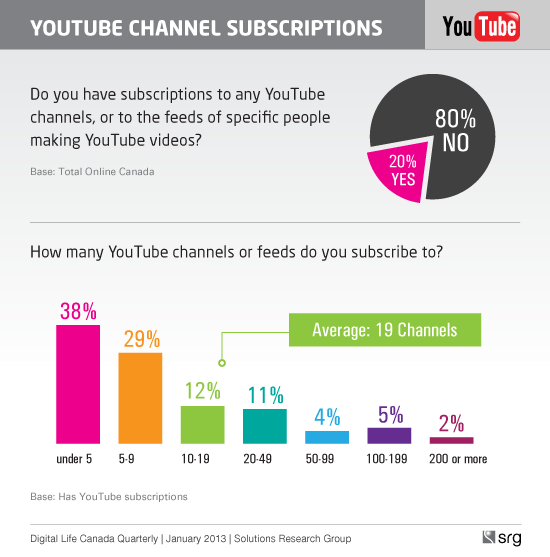 SRG’s most recent quarterly research found that a whopping 80% of online Canadians are watching YouTube every month. That is the highest reach in our six years of quarterly tracking. Daily reach is almost 15 million and 40% are being driven to the videos through social media, links and ways other than going directly to the destination. On average, Canadians are watching 21 videos per week on YouTube and 2% said they watched between 100 and 300 in the past week. Their reasons for watching more YouTube content seem to be mainly because there is more and better content in general but also because there is more content catering to various interests as well as how-to videos and tutorials – from cooking to snowboarding – that inform and educate. It doesn’t seem so long ago that YouTube was viewed as a bit of time waster and not taken very seriously. Now, after eight years of operation, it has evolved into a potent and credible channel for video entertainment. To celebrate its status as a legitimate medium, YouTube staged a major event on March 20 to announce it now has in excess of 1 billion unique users every month. That equates to viewership the size of 10 Super Bowl audiences. With numbers like that it makes sense that, according to YouTube, all of the AdAge Top 100 Brands are running campaigns on the site. Pre-roll video ads are becoming quite common and on their last viewing occasion, 46% of Canadians were exposed to a pre-roll ad – and 30% of those viewers watched the pre-roll ad in its entirety. In the past month, 22% of Canadians watched YouTube video on an internet-enabled device other than a PC or laptop. As content improves in quality, Canadians increasingly want to watch their favourite video on the big screen as well. One-in-five (19%) connected their PC or laptop to a bigger TV screen to watch YouTube. We expect this trend to continue apace with the explosion in the numbers of connected-TV sets, smart TVs and TV apps. Although its roots are in short-form video, engaging longer content is increasingly popular making YouTube a launching pad for aspiring new talent and we’re seeing the emergence of a new star system. 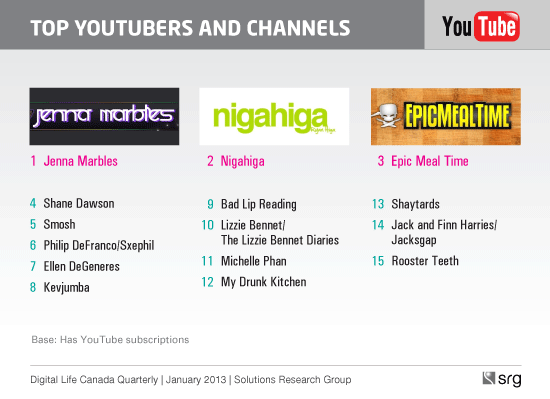 Top YouTubers among Canadians include names like Jenna Marbles and Nigahiga, Shane Dawson and Smosh.com. Epic Meal Time is a Canadian success story. At #3 in our list of top 15 YouTubers among Canadians, Epic Meal Time has attracted 4.1 million subscribers worldwide. Its special episode with Jamie Oliver attracted 1.6 million views. But beyond the pre-roll ads, YouTube is also a popular tool for those doing pre-purchase research. In the past month, 29% (about 7.5 million Canadian consumers) have a watched a YouTube video for or related to something they are interested in buying. With this type of consumer behaviour and the news that some of the popular YouTube channels may soon up their game and charge subscribers, the opportunities for advertisers to reach targeted, engaged audiences are becoming virtually endless. Technical: The results of YouTube in-depth comes from SRG’s Digital Life Canada study which interviews 1,000 online Canadian consumers aged 12 and older every quarter.